Your very own California wine tasting awaits, along with a bevy of sweets and treats. Sit down to 4 bottles of California wines, and get the party started! 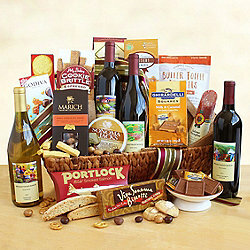 Included are crackers Sonoma Jack cheese, salami, hot cocoa mix, chocolates by Ghirardelli and Godiva, and much more. Enjoy!